idk if anyone else got an email like this. Your blog will be deleted in 20 days if it isn't reviewed, and your readers will see a warning page during this time. After we receive your request, we'll review your blog and unlock it within two business days. Once we have reviewed and determined your blog is not spam, the blog will be unlocked and the message in your Blogger dashboard will no longer be displayed. If this blog doesn't belong to you, you don't have to do anything, and any other blogs you may have won't be affected. Thank you for your understanding and for your help with our spam-fighting efforts. I'm sure the whole thing will resolve itself once I let them know we're obviously not a spam blog. Now we're getting our site reviewed so blogger can conclude we're obviously not spam. Hopefully we'll have this cleared up in 20 days when the school year rolls in and we're expecting more traffic. As with many powerful tools, blogging services can be both used and abused. The ease of creating and updating webpages with Blogger has made it particularly prone to a form of behavior known as link spamming. Blogs engaged in this behavior are called spam blogs, and can be recognized by their irrelevant, repetitive, or nonsensical text, along with a large number of links, usually all pointing to a single site. Here's tonight's especially awesome "Special Comment" by Keith Olbermann on his show, Countdown. Did K.O. just call Senator John Thune (R-SD) a dirty whore??? Hells yes he did! ...What was that one statement worth to you in contributions from the Health Sector, Sen. Thune? Five thousand dollars? Ten? We know what you are, Sir, we're arguing about the price. Don't worry, he doesn't stop there! Keith calls out many of the Republicans blocking much needed health care reform, as well as some of the "Blue Dogs" who have sold their votes to the insurance lobby, leaving their constituents uninsured, under-insured, or otherwise screwed by these soulless-vampires-making-money-off-human-pain. Here's the full Special Comment for your viewing pleasure. If you haven't already heard of Fearless Charities, I highly suggest you check out their website here. They are an NGO that is working in dangerous parts of the globe to ensure that humanitarian aid is properly delivered. Our good friend Nathaniel Smith has been keeping us up to date on FC news. Recently, they participated in a conference with the Center for Complex Operations. Earlier this week our Chief Operating Officer, Nathaniel Smith, and our Head of Research, (the soon-to-be Dr.) Thomas Apker travelled to Washington, D.C. and entered the prestigious halls of the National Defense University to attend a conference hosted by the Center for Complex Operations. The Center for Complex Operations is a joint Department of Defense, State Department, and US Agency for International Development institution tasked with developing better ways for the US government to engage in complex operations - counter-insurgency, relief work in warzones, post-conflict reconstruction, etc. It is easy to understand why Fearless Charities was so keen to be in the room! Our representatives took an active part in question and answer periods, making our presence known and punching well above our weight. During the meet-and-greet following the formal conference, informal discussions were held by our personnel with senior members of other NGOs, with State Department employees, think tank members, and academics. The feedback which Fearless Charities received from these conversations was overwhelmingly positive and supportive. New contacts and opportunities have been discovered and there may be a partnership or two in our future. The NGO community has welcomed our presence and wishes us the best of luck in our future. After hearing from many speakers, both formally and informally, Fearless Charities is more dedicated than ever to maintaining independence from government funding and continuing to develop an advocacy role for the NGO community. It was also made clear that the need for Fearless' services in the world-at-large will only become more acute in the years ahead. On this basis of demand, we are in a growth industry. Fearless Charities looks forward to that growth and fulfilling that demand. 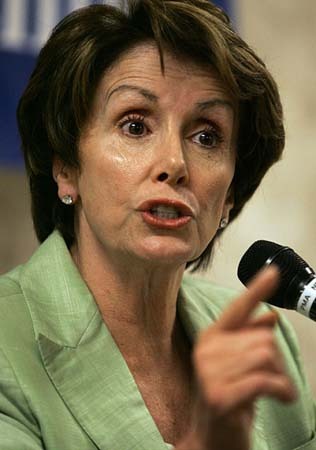 "It's almost immoral what they are doing," Pelosi said to reporters, referring to insurance companies. "Of course they've been immoral all along in how they have treated the people that they insure," she said, adding, "They are the villains. They have been part of the problem in a major way. They are doing everything in their power to stop a public option from happening."